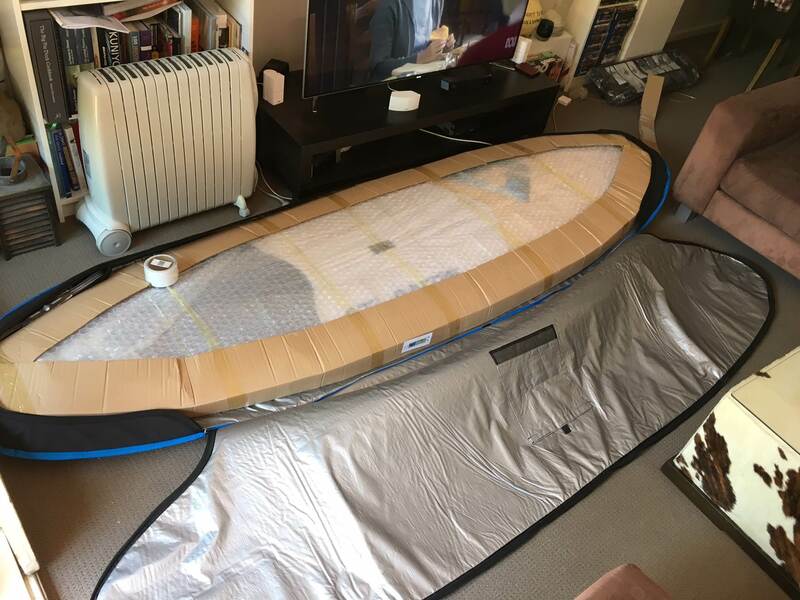 My partner recently bought the Halo 9'6" from Surfboard Warehouse so I thought I'd write a review of our initial thoughts. I'll start by saying that overall we couldn't be happier. This is our fist SUP, and it won't be our last. 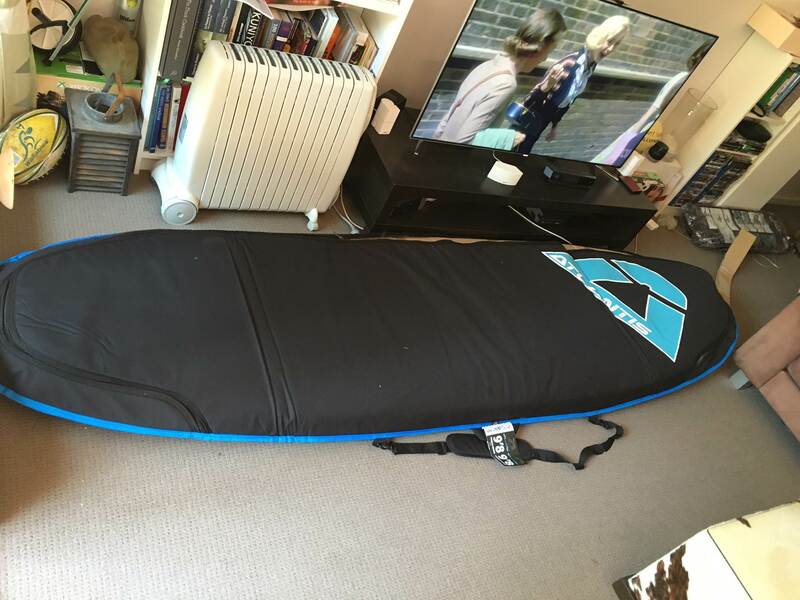 My partner had never surfed or SUPed before so there was a lot of toing and froing on things like 'should we buy a board having never done it before', what size, what brand, how much, etc. In the end we decided to go with the Atlantis Halo for two main reasons, cost, and visibility. As many of you already know the cost of getting into SUPing versus other waterborne pursuits can be prohibitive. 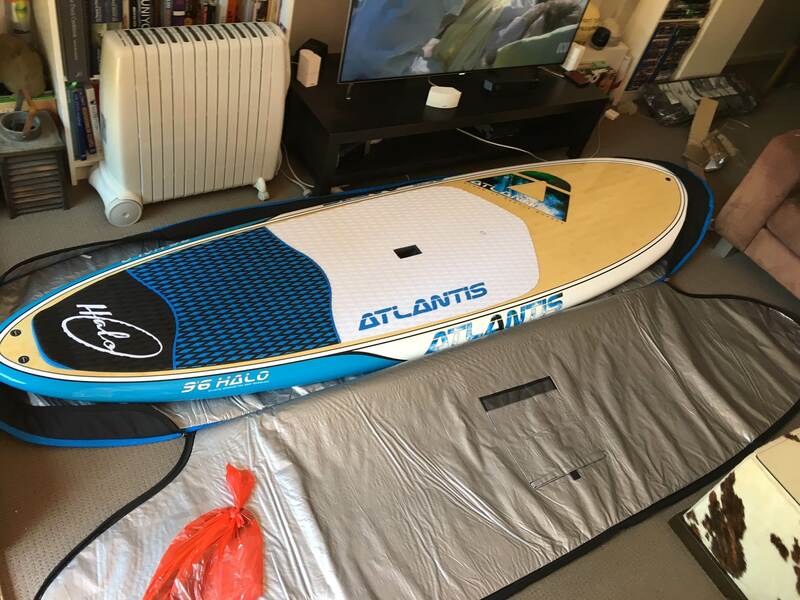 Initial investment in equipment is more than $1,000.00, and compare that to surfing where cheap boards are more prevalent, there is the risk of buying something that you may not like for a decent amount of money. 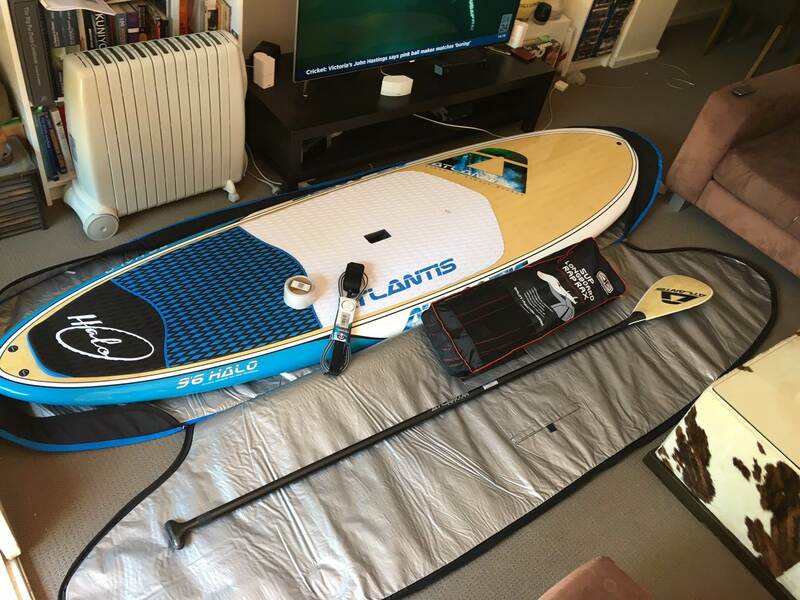 The second hand SUP market isn't as liquid as we initially assumed, so the option of purchasing a new board became serious. If I'm honest, the low cost of this board compared to its contemporaries was a slight cause for concern, assuming that the cost referred to quality. However, what changed this perception for us was the fact the Surfboard Warehouse posted to this forum regularly. Seabreeze.com.au became a regular occurrence in my browser history as we tried to syphon through the propaganda that brands spout on their websites and through their marketing. I can't remember seeing another brand posting on here and answering question as SB Warehouse has and does, so we inferred that they must stand by the products they sell. With theses two things in mind we decided on size based on my partners physical attributes and her level of surf proficiency and picked the Halo 9'6". I rang SB Warehouse and spoke with Jarrod who organised the extras pack with a paddle, bag, rail tape, etc. The wait for the board was agonising. It took 10 days to get down to us (we were hoping for next day delivery #overexcited). The box had sustained some damage in transit, but once I'd open everything up I saw that the board was packed securely in bubble wrap. The boards itself was light, solid, and clean. I had thought it would be heavy and cumbersome, but this is not the case. The construction is solid, not like that of a normal fibreglass board, but more like a plastic Coke bottle. This is not a backhanded compliment. Plastic Coke bottles are tough, and tough is the impression the board gives me. The bamboo looks great too. Deck pad is nice and clean with tight cut lines (not excess tags of farm hanging off anywhere) and glued down solidly in all places. Leg rope plugs were clean of debris and easy to install the rope. There was a small circular ding on the left side of the board about the size of a paracetamol tablet but it wasn't anything that worried me. The only criticism I can find so far is that the fins have some side to side play once screwed in the fin box. This is the first board I have owned (it's my partners board, but I'm sure you know what I mean) that has the Future Fins style straight fin box. My surf boards have FCS and glassed fins and I'm used to them being more solid, with fin flexion the only movement. Not sure if this will have any affect on the waves because I haven't taken it out in decent surf yet. Also, the centre fin box in narrower at the bow end than the stern, so the centre fin can't slide up to the top, but this won't really be a problem, I can't see us needing to do that. The accessories pack is really good. The bag is nice, leg rope nice, and paddle nice. We got the upgraded fixed paddle. Cutting it down to the right size was an ordeal in itself. Not because it was complicated, but because there are seven different methodologies for picking the right length, but we decided on a length and we are happy. The handle is really comfortable in the hand too. Installing the rail tape was fairly straight forward, but only because I watch a 4 minute tutorial before attempting the installation. Had I not of watch that I'm pretty sure i would've ruined the board. As I said at the start, we're happy. The board is everything we hoped for. I'll be getting my own board from From SB Warehouse, probably the Evoke Carbon. I only spoke with Jarrod once but he was more than helpful. 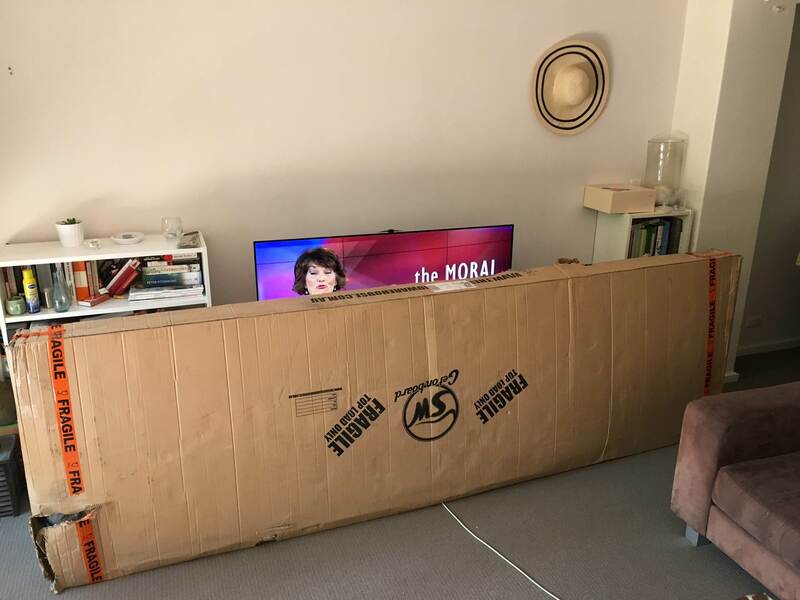 Below are some photos of the day it arrived and the unwrapping process. Hope this post is helpful to others who are deciding on a board. All too often people come on here and have a go at the shop when something goes wrong, but not often enough do they come on here and tell everyone about their good experience. Good on you. Congrats on the purchase and thanks for sharing your good experience. That's good to hear! I was in the same boat, I live interstate and had to purchase without seeing one(evoke )in person. I'm very happy with the product and their customer service is great. Props to Jarrod and crew! Purchased a 10,6 not long ago from SBWH arrived with some slight damage on the nose. Problem resolved very quickly. $650 for a brand new board?? can't beat that. A mate bought a couple from them as well,it's a wonder there are not a lot more of them down here In vic.